Once you have selected your recipients, click on the plus button next to ‘Send an SMS’ to start composing your SMS. 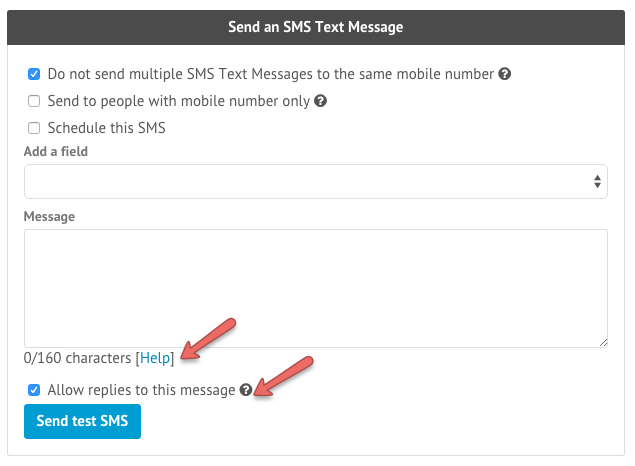 This option will only be enabled if you have set-up SMS Text Messaging in your account. Don’t forget to keep an eye on how many characters you are using and choose whether to allow replies to your message. When you allow replies to messages, your SMS cannot be received from the Sender ID you specified in your settings. However, if you do not need to receive replies, your message will be received from your Sender ID.